Welcome to Fulton Warehouse & Distribution. Call us at 404-349-0091 for a quotation! We help our client companies SAVE MONEY by reducing their operating overhead, reduce the risk and danger of storing and handling hazardous materials, and significantly lessen companies capital expenditures on non-strategic assets. Our third generation of family ownership has brought about a seamless process emphasizing service to our client companies and helping them develop a competitive edge. We are a 3PL Warehouse and Transportation serving Atlanta. 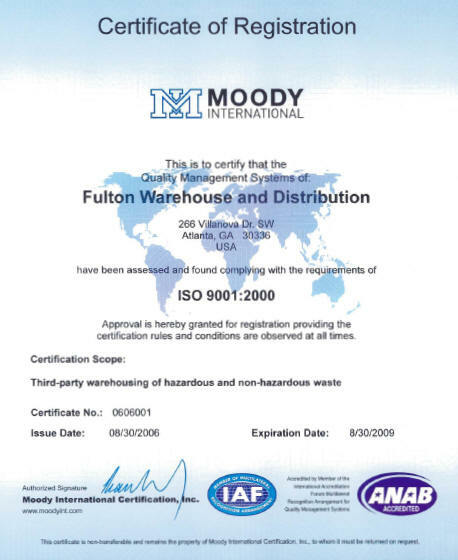 Proud to be ISO 9001:2008 Certified!